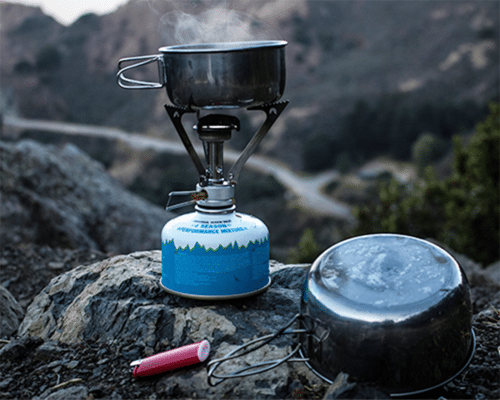 Expert recommendations and in-depth reviews on the best outdoor gear. Our outdoor gear guides help you compare and find the gear you need. The iconic Base Camp Duffel was first introduced in 1979 and unlike other outdoor products has changed very little over the years. It’s still our all-time favorite duffel bag and for good reason. Its simple rugged design makes it nearly indestructible. We have used this bag on expeditions all around the globe and it has served us extremely well. Ask anyone who has used this bag before and they will tell you how much they actually love it. For its 30th anniversary, The North face released an updated Base Camp Duffel with some new features, making it the best duffel bag to buy today. The Base Camp Duffel is made from a durable laminate material that is water repellent and tear resistant. A large D-zip opening provides easy access to the main compartment. The massive YKK zippers don’t snag on gear easily and allow you to close the bag, even when the duffel bag is filled to the brim (and some more). This duffel bag features a mesh pocket in the lid, allowing you to organize smaller items. This updated version features a separate zippered compartment at one end of the bag. This is a great because it allows you to separate wet clothes, dirty shoes or extra gear from the rest of the bag, without sacrificing volume. Be aware that this zippered compartment is only available on the medium and large model. The XS does have a small zippered pocket on the side for your phone or other small items. With 31 L it’s quite small but works well as a backpack duffel bag for everyday use. The S also has an end pocket, but it’s a lot smaller than the M or L. The XL and XXL models don’t have any separate compartments but are so big, you probably won’t need them. Padded, detachable, alpine-cut shoulder straps allow you to carry the bag comfortably on your back. Four side handles, one on each side of the bag, serve both as carry and haul handles. The four compression straps on the outside of the bag can be used to take up any extra space in the bag and make the gear inside more secure and protected during transport. The North Face offers a Lifetime Warranty on this item. 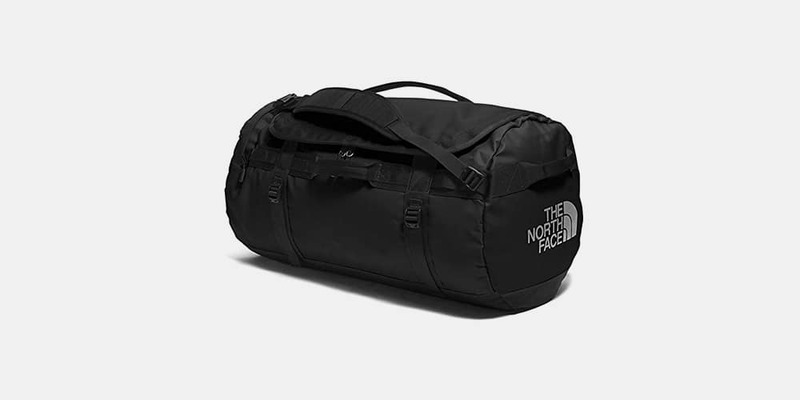 The The North Face Base Camp Duffel is available in multiple colors and prints and in the following sizes: 31 L (XS), 50 L (S), 69 L (M), 95 L (L), 132 L (XL) and 150 L (XL). There is also a wheeled version available. 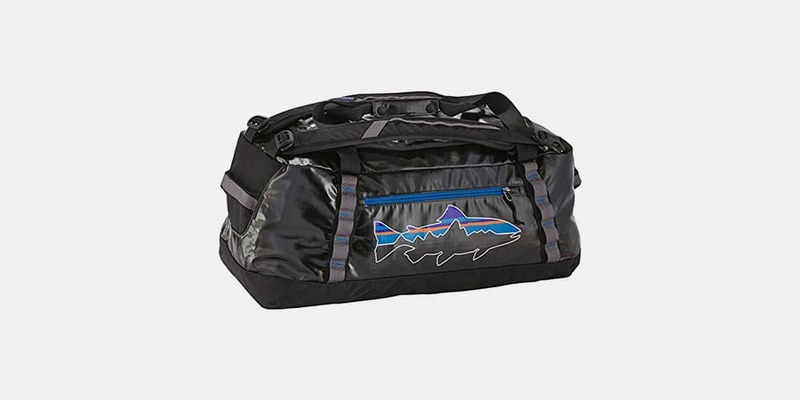 If you are looking for a lightweight but still extremely sturdy duffel bag, then the Patagonia Black Hole Duffel Bag might be the perfect bag for you. The 60L version only weighs a little over 1 kg, but the 15-oz 900-denier 100% polyester ripstop with DWR finish ensures your gear stays well protected and dry. The 60L version is a perfect size for weekend trips or a well-organized extended trip. The mesh pockets in the lid and zippered side pocket allow you to organize smaller items. Unlike the North Face Base Camp Duffel, this bag does not have a separate larger compartment that is accessible from the outside. It does feature a small zippered pocket on one side, but it’s too small to be really useful. The bag features internal compression straps to hold gear down, but we would like to have seen these on the outside as well. External compression straps make a duffel bag easier to handle when not completely full and far more comfortable when carrying like a backpack. The Patagonia Black Hole Duffel Bag is available in the following sizes: 45 L, 60 L, 90 L and 120 L.
There is also a wheeled version available, but it’s a lot more expensive. The Gregory Alpaca Duffel Bag is one of the strongest and most weather resistant bags on the market. Only the Base Camp duffel uses a slightly heavier and thicker fabric. This is a great quality bag with attention to detail and offers some great features. The only things we didn’t like were the lack of compression straps on smaller models and the size of its external pocket. Padded removable backpack straps make this duffel bag comfortable to carry over long distances. They can easily be removed via ladder-locks and girth hitches when you don’t need them. It is probably a good idea to remove the backpack straps while traveling by plane, to make sure they do not get hung up in conveyor belts and such. The main compartment of this duffel bag is easily accessible via a D-shaped zipper and allows the entire top panel to open up for easy packing. The lockable zippers add security and feature reflective pull tabs, making it easy to find the opening in low light conditions. This bag features 2 zippered mesh pockets under the lid and an externally accessible end pocket. These offer some great organization options although the end pocket is quite small. This is a great all-round performer and should last you many decades thanks to its quality construction and use of great materials. 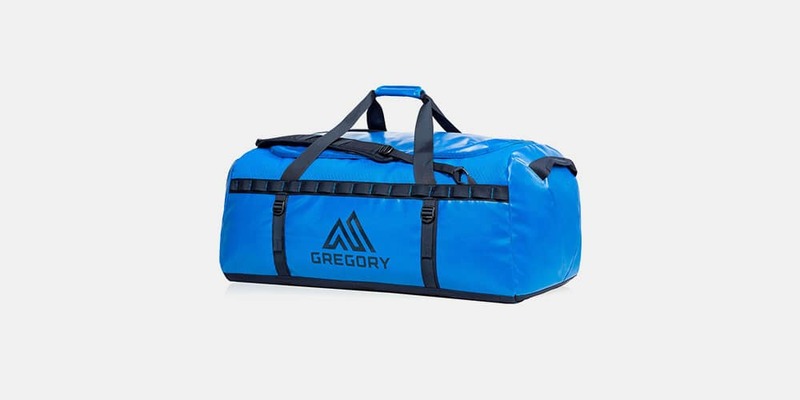 The Gregory Alpaca Duffel Bag is available in the following sizes: 30 L, 45 L, 60 L, 90 L, 120 L.
Weighing in at just under 1 kg for the 90 L model, the Eagle Creek Cargo Hauler is definitely the lightest bag on this list. Although it is not as durable as most of the other bags, it does come with some nice features. Eagle Creek, mostly known for its packing organizers, knows how to add some great organization options to this duffel bag. This bag features two sizable easy-access zippered end pockets for gear organization. The bottom of this bag is padded, adding some good protection against impact. Removable shoulder straps make this bag comfortable to carry as a backpack. The larger sizes do not hold their shape all that well while carrying on your back, this can be a problem when the bag is not completely full. The large main compartment is easily accessed by #10 lockable zippers with finger-friendly pulls. Carry handles and six heavy-duty lash point make it easy to carry and strap to a roof rack for example. The Eagle Creek Cargo Hauler can be packed in one of its end pockets, making it easy to store. If you are mainly looking for a lightweight bag that you can easily store away, then this bag is for you. The lightweight fabric doesn’t give you as much durability, so if you plan on moving a lot of heavy sharp gear (climbing gear and such), you should probably look elsewhere. 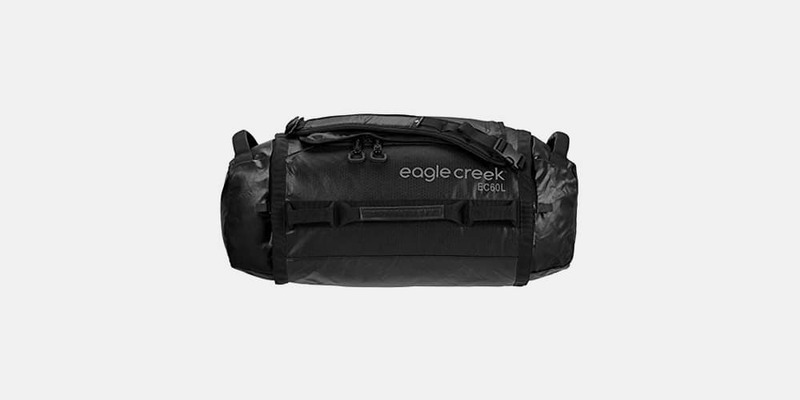 The Eagle Creek Cargo Hauler is available in the following sizes: 45L (S), 60L (M), 90L (L) and 120L (XL). When you need or want to take your gear kayaking, rafting or on another water involving adventure, your going to need a waterproof duffel bag. Although most of the other bags features in this list are weatherproof, they are not totally waterproof and submersible. 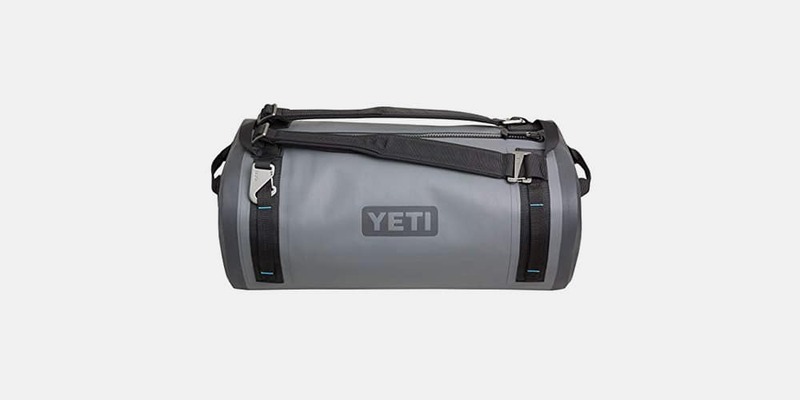 That’s where the YETI Panga comes in, the best waterproof duffel bag of 2019. You probably know YETI from their quality coolers, but as it turns out, they also make some awesome duffel bags. 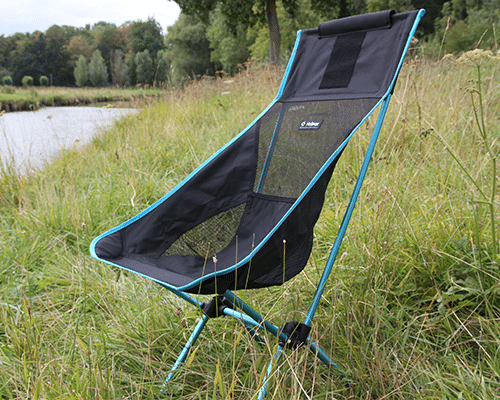 The EVA molded bottom provides a sturdy and waterproof landing pad for the Panga. The Thickskin shell is made of high-density nylon and tpu laminated, making it puncture and abrasion resistant. The Hydrolock zipper is where the magic happens. Water stays out and everything inside stays dry. This duffel bag does not have a U or D shaped zipper as most of the other bags, which makes packing it a bit more difficult. It does feature two stowaway mesh pockets to organize smaller gear and valuables. The Yeti Panga is quite expensive, but if you need a waterproof duffel bag, this one is definitely the best one on the market today. 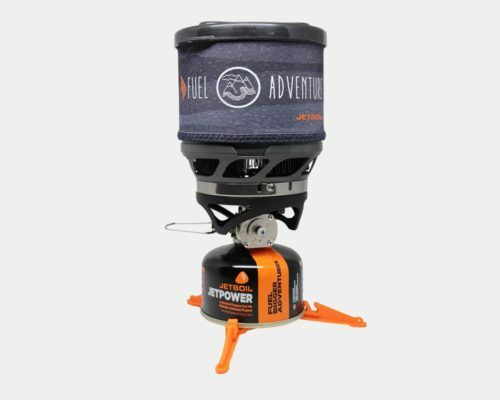 The YETI Pang Duffel Bag is available in the following sizes: 50 L, 75 L, and 100 L.
EVA molded bottom provides a sturdy and waterproof landing pad for the Panga. The Marmot Long Hauler Duffel Bag at first glance has all the main features you would want in a duffel bag. It has 2 sizable end pockets for shoes and other gear, quick release compression straps, and detachable multi-function shoulder straps. Sadly the material of this bag, especially on the bottom, is not as durable and weather resistant as some of its contenders, like The North Face Base Camp and Gregory Alpaca. The North Face Base Camp, for example, uses a durable 1000D TPE ripstop fabric throughout, instead of only at the top. If you are looking for a multi-function bag that you can use for travel, but also take to the gym, then this would be a good option. The padded backpack straps can easily be removed. You can also connect the straps together and carry the duffel bag briefcase style. The straps can be shortened, to make carrying it as a briefcase more comfortable. The main compartment of this duffel bag is easily accessible via a D-shaped zipper and allows the entire top panel to open up for easy packing. The Long Hauler does not only have two sizable end pockets but also features two zippered internal pockets inside the main compartment. One is positioned under the lid, the other towards one end of the bag. All these pockets make packing and organizing this bag a breeze. The 4 compression straps with quick-release buckle, 2 on each side, work well but are only available on the L and XL model. The bottom of the duffel bag is constructed of two layers of fabric but is not as thick as other models. All model sizes also feature internal compression straps, to help secure gear. The bag features some small daisy chains, which can be used to strap it down. These are adequate, but not as strong (fewer bar-tacks) or as useful as the full-length daisy chains on other models. The haul handles, although not available on the small model, are a great feature and make lifting the bag out of the luggage carousel or from your car easy. 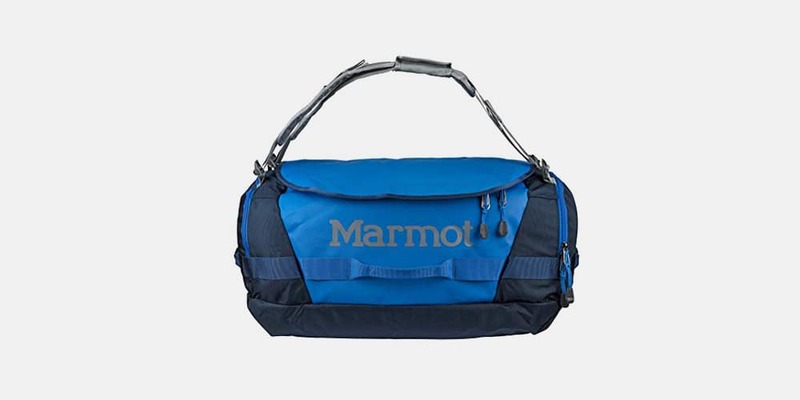 The Marmot Long Hauler is available in the following sizes: 38L (S), 50L (M), 75L (L) and 105L (XL). Detachable, adjustable handles that convert into shoulder straps. Sea to Summit, maker of some of the best camping pillows, dry bags, and other outdoor accessories, released the Sea to Summit Duffle Bag in mid-2017. 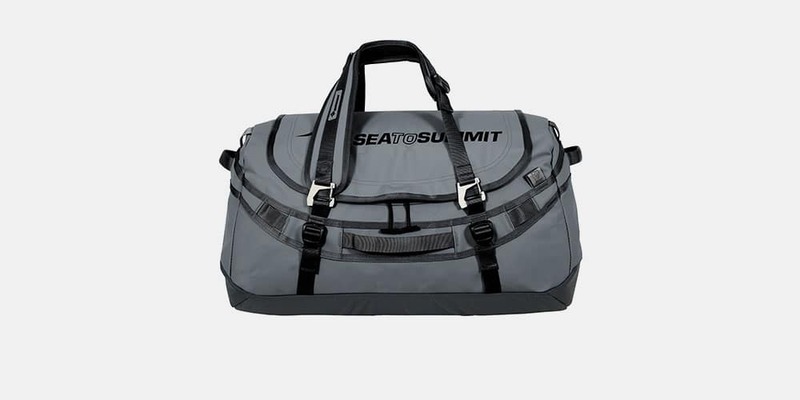 Although the duffel bag market is already quite saturated, Sea to Summit gave this bag a right to exist with some impressive innovative features. This duffel bag is the only one on the list that features magnets. The main selling feature of this bag is the lid however, which opens 40% wider than conventional duffel bags. This super burly duffel bag is intended for rough and tough expeditions and over-landing adventures. So where did they need magnets for? The shoulder straps of this bag can be detached and reconfigured into multiple carrying options. The duffel bag can be comfortably carried as a backpack or slung over one shoulder by removing one of the straps and re-positioning the other. Strong magnets in the middle of the straps hold them together if you want to carry it briefcase style. If you need help configuring the straps, there are instruction icons on the inside of the lid to help you out. The Sea to Summit Duffle Bag does feature 1 internal zippered pocket, but sadly no external pockets. Although access to the main compartment is great, thanks to the large lid, we still would like to have seen some more organization options. Packing is a breeze however thanks to its tall shape and not-floppy construction. Lash loops for attaching to expedition vehicles, touring motorcycles and animals are positioned on both sides as well as some haul handles. If this bag would have had an external compartment as well, it would definitely have ranked high up with the Gregory Alpaca and Patagonia Black hole. It’s a great bag, but that is our only gripe. You could of course just buy some additional Sea to Summit stuff bags, to satisfy your organizational needs. The Sea to Summit Duffle Bag is available in the following sizes: 45L, 65L, 90L, and 130L. The Helly Hansen Duffel 2 is, as the name suggests, the updated version of the Helly Hansen Duffel. The designed remained mostly the same, but the materials were upgraded to a more durable PU Laminated Polyester. The older version was not all that durable and the seams often got undone. This new version seems to be of better quality and the material is definitely more weather resistant. A nice feature of this bag is the removable shoulder straps, which can fast and easily be tucked away in a specially designed pocket. The shoulder straps are padded but not as comfortable as some competitors. The bag has a pair of duffel handles on top and 2 haul handles on the ends, but no good daisy chains or compression straps. The main compartment of this duffel bag is easily accessible via a U-shaped zipper and allows the entire top panel to open up for easy packing. The zippers on this bag are not as large as on other duffel bags featured on this list but feel adequate. This duffel bag features an internal pocket and one external pocket with zip but it is quite small. The bag comes with a small wash bag, that can be used to store the duffel bag when not in use. We would like to have seen some more pockets, compression straps, and maybe slightly more comfortable backpack straps. But overall this bag is adequate and should suffice in most travel situations. This bag is quite expensive so in terms of value, there might be better duffel bags out there. 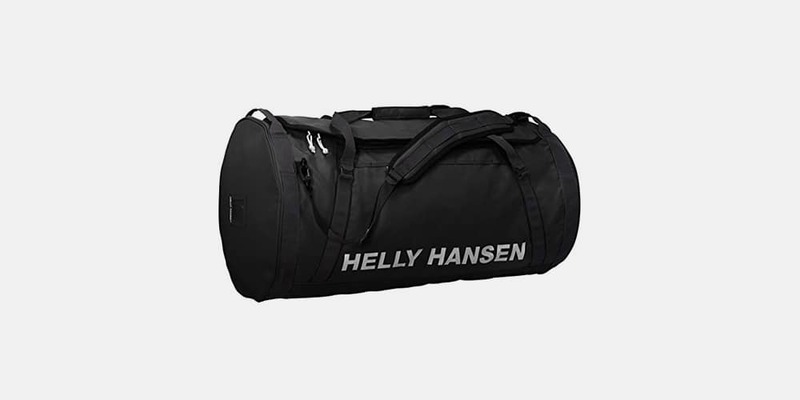 The Helly Hansen Duffel 2 is available in the following sizes: 30L, 50L, 70L, 90L and 120L. Carrying a fully loaded duffel bag all day can be exhausting, luckily wheels where invented 3500 B.C. 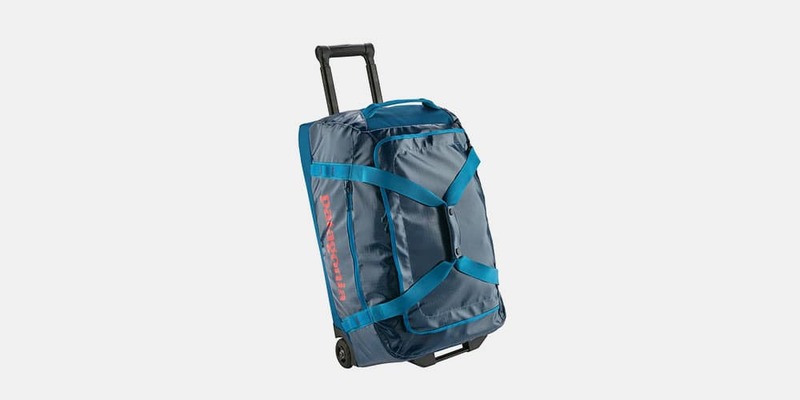 If you need to move a lot of gear and are looking for a wheeled duffel bag, the Patagonia Black Hole Wheeled is the best wheeled duffel bag of 2019. Featuring the same quality constructing as the standard Black Hole, this version adds some quality wheels and burly frame. This model offers a nice blend of features, quality construction and it’s highly water resistant. 3.5-inch wheels and its burly frame make this bag very easy to maneuver, making it very comfortable for travel. The main compartment of this duffel bag is easily accessible via a U-shaped zipper and allows the entire top panel to open up for easy packing. Two carry handles on and the ends allow you to pick it up easily. The duffel bag does have two internal compression straps, although we would like to have seen these on the outside as well. This bag features 2 zippered mesh pockets under the lid and an externally accessible side pocket. These offer some great organization options although the side pocket is quite small. This bag is great for navigating around the airport and thanks to its solid construction and tough polyester ripstop should last you a long time. If you mainly use your duffel bag for going to the gym and only use it on the occasional weekend trip (to haul heavy gear), then it’s probably better to buy a more affordable although slightly less weather resistant duffel bag. 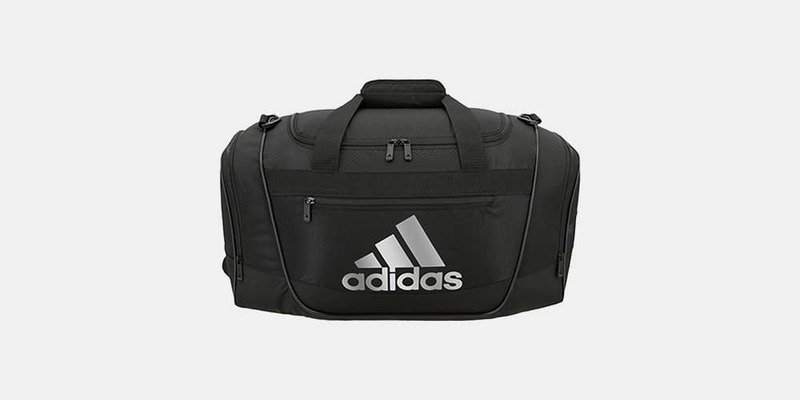 The Adidas Defender III has some great organizational features to offer and the FreshPAK technology keeps your bag fresh if you pack it with stinky gym clothes. This bag comes in roughly 30 different colors, so you should be able to find one that suits your style. This duffel bag features one padded removable shoulder strap and comfortable haul handles. No backpack straps means it can be uncomfortable to carry with heavy loads. Only the medium and large bags have a shoulder pad, the small only comes with a carry strap. The bag holds its shape quite well but does not have a really thick padded bottom or compression straps. The main compartment of this duffel bag is easily accessible via a D-shaped zipper and allows the entire top panel to open up for easy packing. Two large side pockets allow you to separate your wet shoes or smelly clothes from the rest of your gear. If you have large shoes, it’s probably best to opt for the large or medium version. The Defender III also has an extra externally accessible pocket on one side, which the defender II did not have. If you don’t need the ruggedness and weather resistant features of some of the other bags, then this bag could be a very good option. It features some great organization options for its price and is available in many colors and styles. Can you bring a duffel bag as a carry-on? Yes you can. Most airlines allow carry-on bags no larger than 22″ x 14″ x 9″ or 56 x 35 x 22 cm. Some airlines only specify a size limit of 45 linear inches of combined length, which is the length, width and height added together. This equates to roughly 45 liters in volume. If you buy a duffel bag that is approximately this size then you can use it as a carry-on (check comparison table for options). Rules can change and size-limits can vary between airlines, so be sure to check the specifics before departure. Since duffel bags are cylindrical and not square like other carry-on bags, it’s best to use the dimensions mentioned above as a general guide. A duffel bag is soft and can easily be squeezed into the overhead compartment if it’s not totally filled to the brim. If you bring an over-sized bag (45+ liter), be sure to leave some empty space in the bag, so it can easily mold to the shape of the overhead compartment. I would recommend not going with anything larger than 50-60 liter as anything bigger becomes too long. Be sure to also check the weight limit of your carry-on luggage (if there is one), since this can vary between 5 and 23 kg. Here you can find a list of carry-on size and weight limits from 170+ different airlines. 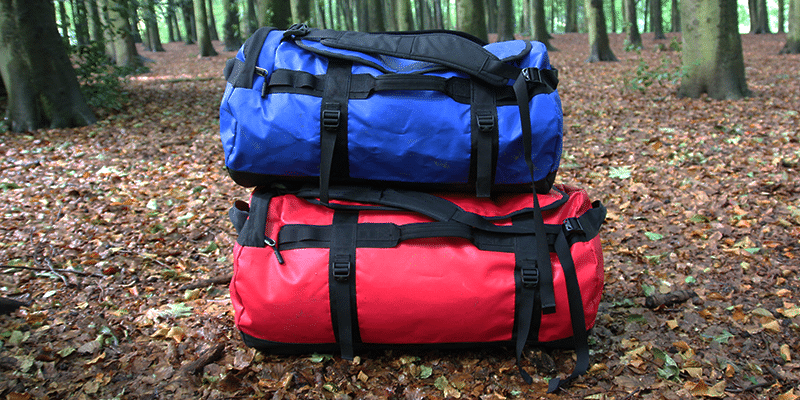 If you want to be on the safe side, go for a 45 L bag, which should still be large enough for normal weekend trips. You can check the comparison table to see which models are available in this size. 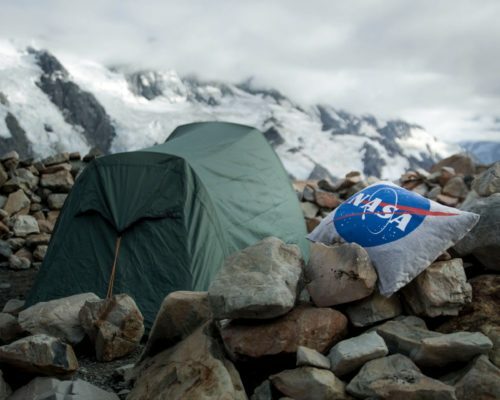 A 50-liter Base Camp or 60-liter Black hole can also be flown as carry-on (this is my personal experience), but you can run into trouble if you pack too much gear. What size duffel bag should I get? Different adventures require varying amounts of gear and so choosing the right size duffel bag can be a challenging task. As a general guide, we recommend a 50-70 liter bag for weekend trips. This is plenty large enough for camping trips where you need to bring things like a sleeping pad, sleeping bag, cooking gear etc. For longer trips and expeditions you will most likely want to buy something larger like a 90+ liter model. Compareoutdoorgear.com is a participant in the Amazon Services LLC Associates Program, an affiliate advertising program designed to provide a means to earn advertising fees by advertising and linking to amazon(.com, .co.uk, .ca etc) and any other website that may be affiliated with Amazon Service LLC Associates Program.